You can use any one of many messaging apps on an Android phone. Sometimes these alternative apps store messages in a way that is not compatible with the ordinary messaging app, so Text Collector is unable to retrieve messages for printing. The stock Android text messaging app is usually called “Messaging” or “Messages.” It comes preinstalled on all Android phones and should not be confused with “Android Messages,” a different app from Google that needs to be installed separately. If you’re using WhatsApp, you probably know you’re using it, as opposed to ordinary text messages. WhatsApp messages and the like will not appear in Text Collector collections. Unfortunately, the reasons aren’t always quite so obvious: cell carriers like to provide their own messaging systems with different features. These are usually branded “Advanced,” “Chat,” “Messages+,” or “RCS.” Typically, the phone manufacturers build the support for carrier-specific messaging into the stock messaging app. Usually, you can tell that your phone and carrier has one of these when you see indicators like “so-and-so is typing” while somebody on the other end writes a message. If you notice messages missing, or any other problem with your collection, please write to help@legaltextcollector.com. On some phones, draft messages may not appear. 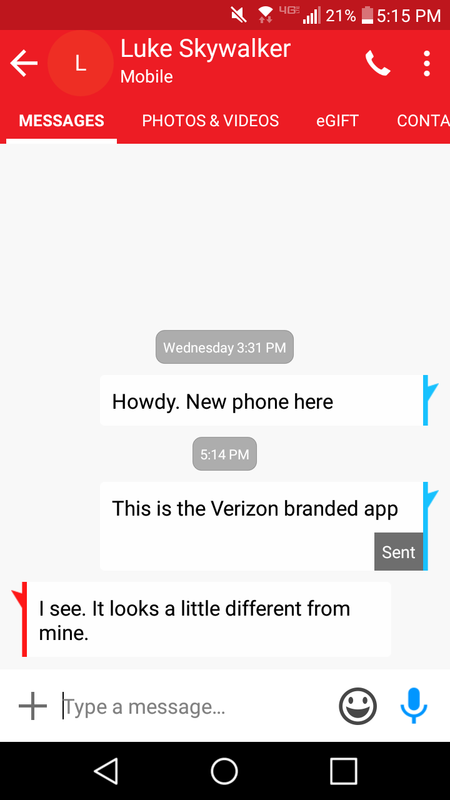 Using Text Collector with Verizon Messages+ is not recommended. Also, Text Collector might encounter some messages with status codes it doesn’t recognize: it will label them [Unknown message status]. If you see this, please write to help@legaltextcollector.com. On AT&T and T-Mobile (including Metro PCS), LG phones use the carrier’s “Advanced” messaging. Starting with version 1.2, Text Collector can usually collect these messages, but there are occasional problems. These can affect messages with other customers on the same carrier. LG phones can share location that appears as a map in the messaging app. Text Collector does not render the map of these location messages, but the underlying location data will be saved as an attachment. If Text Collector finds messages with status codes it doesn’t recognize, it will abort the collection. If your collection fails, please write to help@legaltextcollector.com. On T-Mobile (including Metro PCS), Motorola phones use the carrier’s “Advanced” messaging. Motorola phones store these messages in the same way as ordinary text messages, so they cause no known problems. On T-Mobile (including Metro PCS), Alcatel phones use the carrier’s “Advanced” messaging. Starting with version 1.4, Text Collector can collect these messages. This might be the same on other carriers, but has not been tested. On T-Mobile (including Metro PCS), HTC phones use the carrier’s “Advanced” messaging. Text Collector currently cannot collect these messages, so messages with other T-Mobile customers can be missing from the collection. This might affect other carriers, but has not been tested. Using Text Collector with Verizon Messages+ is not recommended: even though Text Collector can access most messages, there are some it cannot. Plus, Text Collector sometimes will find the wrong recipients for messages it can access. Print messages from the Verizon Web interface. When viewing a thread, the “print” button can be found in the toolbar. Use the built-in backup option and open the backup files with this online Verizon Messages+ Viewer. As a last resort, screenshots are always an option. On Xiaomi phones, selected contacts may be “blocked.” Messages from blocked contacts generally don’t appear in Text Collector collections. To ensure that all messages appear, unblock numbers from the Contacts app.